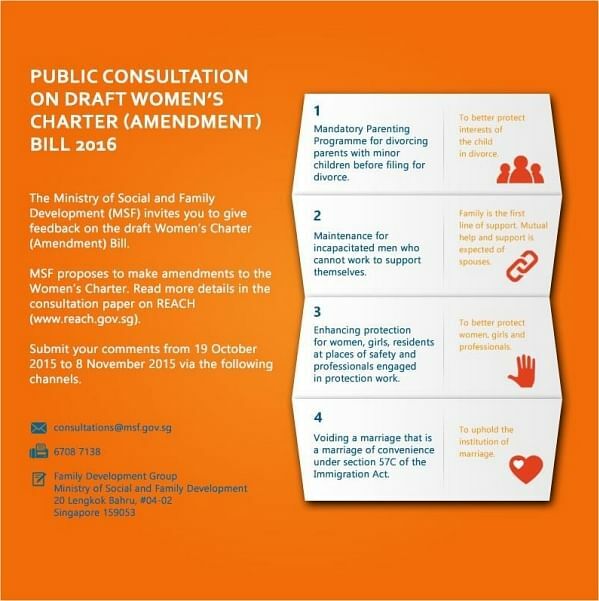 SINGAPORE - The Ministry of Social and Family Development (MSF) is consulting the public, via the Internet, on proposed amendments to the Women's Charter . It seeks feedback on four key proposals, including a mandatory parenting programme for divorcing parents; maintenance for men incapacitated by physical and mental disability; greater protection for those affected by family violence as well as the staff of homes and shelters, and the voiding of marriages of convenience as defined under the Immigration Act. MSF also seeks to extend the mandatory Marriage Preparation Programme to all marriages in which at least one party is below the age of 21.